There's no quicker way to refresh a room than by changing out the decorative pillows. 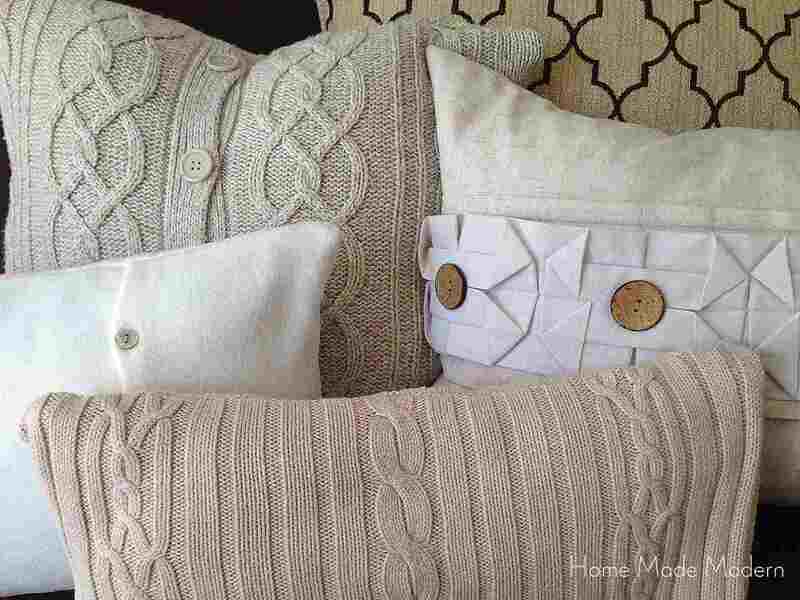 With a quick pillow swap, you can add texture, tie in a new color, and add interest with the pattern all at the same time. While you can certainly buy ready-made pillows it can often be cheaper to make your own, especially if you get creative with material choices. A yard of fabric can easily cost $15 or $20; but, the ideas from these bloggers show how thinking outside the box can result in one-of-a-kind decorative pillows for your space that cost much less, and are easy to sew, even for beginners. Using sweaters to make decorative pillows adds so much texture and warmth to a bed or couch, particularly in the colder months. Perhaps you have some moth-eaten sweaters headed for the rag bin already. But if you don't, Goodwill or Salvation Army always have a ton to choose from. Look for cable knit sweaters for maximum interest. Cardigan sweaters are great choices, too, because you can use the buttoned front to slip a pillow in and out. First off, don't overlook kitchen textiles when thinking about creating your own pillows. Home Stories A to Z made these beautiful spring print pillows out of placemats and cloth napkins. While you're in the kitchen and dining aisles, check out table runners as an option for sewing pillow covers as well. Vintage feed sacks or burlap sacks make great conversation pieces as pillows because they often have great graphics and add a sense of history to a space. Liz Marie Blog shows us how she made a ​burlap sack pillow to add an eclectic accent to her couch. Now, this is really original. Centsational Girl made an accent pillow out of a bath mat that adds amazing texture to the space. Surprisingly, the finished product doesn't look like a bath mat at all, but a high-end accent you'd find in a stylish boutique instead. The Painted Hive found a set of two tea towels for $10 and made these one-of-a-kind lumbar pillows with a vintage vibe. Check out vintage linens or tablecloths for a similar look, or if you are handy with a needle and thread, buy an inexpensive set of flour sack towels, embroider them, then sew them up. Button-down shirts are perfect for making pillows because, like the cardigan sweaters above, the buttoned fronts eliminate the need for sewing on two of the four sides. Again, your closet may already need cleaning out; but, if it doesn't, thrift stores are bound to have what you need for this project. At just $2 to $3 per shirt, you can afford to cover two couches worth of pillows. Don't stop at shirts, however; consider using suits for their subtle, tailored stripes, checks, or houndstooth patterns.